So Congress has passed a bill to avoid the tax cliff, hallelujah. This is the way to look at it if you have a pre-Copernican view of politics where Washington is the center of the economic universe. The better way to see it is that the tax bill on the private, productive part of the economy is now coming due for President Obama’s first-term spending and re-election. The Senate-White House compromise grudgingly passed by the House is a Beltway classic: The biggest tax increase in 20 years in return for spending increases, and all spun for political purposes as a “tax cut for the middle class.” But taxes on the middle class were only going up on January 1 because the politicians had set it up that way, manufacturing a fake crisis. The politicians now portray themselves as scrambling heroically to save the day by sparing the middle class while raising taxes on small business, investors and the affluent. 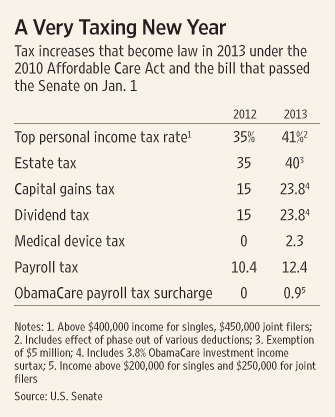 The nearby table shows the taxes that are going up this year. The best that can be said is that Senate Republicans managed to moderate the increase in the death tax from what it would have been, and to spare some upper middle-class families from even higher taxes by raising the income threshold for the new 39.6% top rate. But even those families will still see their taxes raised because couples making more than $300,000 will begin to have their deductions and exemptions phased out as their income rises. The bill also makes most of the tax provisions (including a fix to the Alternative Minimum Tax) permanent, which removes some uncertainty from business and investment decisions. So much for the good, or shall we say the less bad, news. On the other hand, the tax rate on capital gains will rise to 23.8% (including the 3.8% ObamaCare surtax), the highest rate since 1996, and at a time when business investment is mediocre. This contrasts with countries like Singapore and the Netherlands that compete with the U.S. for capital and have a capital-gains tax rate of zero. The estate tax deal is a reprieve only compared to the 45% that Mr. Obama wanted and the 55% that would have hit without a deal. Republicans still had to agree to a rate increase to 40% from 35%, and the $5 million exemption is a pittance for 50 years of work and thrift. After paying a lifetime of taxes on wages and salaries, business and farm profits and capital gains, Americans who save their money rather than spend it get the reward of giving 40% to Uncle Sam. As a political matter, the GOP also gave a big break to Democratic Senators running in 2014 who would have had to defend the 55% rate. Mr. Obama said on New Year’s Eve that he wants to pursue “tax reform” this year, but the Senate-White House bill is a walking repudiation of the concept. It’s especially embarrassing that Republicans went along with this, given their 2012 campaign support for fewer loopholes in exchange for lower rates. We trust the CEOs who pushed for these special-interest provisions realize they can kiss goodbye their hopes of reducing the 35% corporate tax rate any time soon. Keep in mind that this entire exercise was also supposed to promote “deficit reduction.” But the bill’s special-interest favors give away much of the new tax revenue that Mr. Obama says he wants, and the bill’s estimate of $620 billion more revenue over 10 years is probably too high as the rich change their behavior to avoid the higher rates. In any event, this bill increases spending by at least $30 billion by extending extra jobless benefits for another year. It also postpones for two months the automatic spending cuts that were set to begin this week, so in February we can all witness the delights of another phony showdown that will result in more phony deficit reduction. Maybe they can combine those with a phony debt-limit fight too. The private economy is growing, so perhaps it can absorb these tax shocks and keep moving. The tailwinds from the housing recovery and oil and gas revolution are helping, and the stock market is rising on a tide of easy money. But the higher rates will make the U.S. less competitive and keep growth slower than it might have been. As we learned in the 1980s and 1990s, faster growth than the anemic Obama recovery is the only real way to reduce deficits. If there is a silver lining to this fiasco, it is that this may be the high-water mark of Mr. Obama’s redistributionist tax agenda. The President has had unusual leverage over Republicans because he just won re-election and because taxes were going to go up even if they did nothing. The GOP wanted to avoid the blame for not sparing the middle class from the higher rates. But we hope the GOP has learned, after two failed attempts, that Mr. Obama is not someone with whom it can do a “grand bargain.” Even as the Senate deal was taking shape, Mr. Obama gave a speech literally taunting Republicans for agreeing to raise tax rates. He also made clear that the price of any future spending cuts or entitlement reform will be another tax increase. He doesn’t want to reform government. He wants to expand it and destroy GOP opposition to his agenda in the bargain. Having been cornered into letting Democrats carry this special-interest slag heap through the House, Speaker John Boehner should from now on cease all backdoor negotiations and pursue regular legislative order. House Republicans should pursue their own agenda and let Mr. Obama and Senate Democrats pursue theirs. Mr. Obama has his tax triumph. Let it be his last.